What do ladies love more than treats and pretty things? Nothing! Surprise a lovely lady in your life with a Rose ganache, lychee buttercream, house made raspberry jam, lychees and fresh raspberries treats that's almost too good to eat. Not really though. Available until the end of February. I was lucky enough to receive one of these for Christmas (thanks Laura!) and couldn't wait to partake! What a romantic little date for you and your aspiring chef. Guys, if your lady hates cooking, please just buy her the fabulous treats on the left. You're welcome. My first pick is for the romantic. Give this beautiful book with a candle, bubble bath and bottle of wine (some flowers wouldn`t hurt either - wink wink) and you have mastered the gift of romance. Pablo Neruda has a way with words that is all about love and his poem I do not love you`` is one of my favorite love poems. Woo your love with a book of poetry for the ultimate gift of romance. 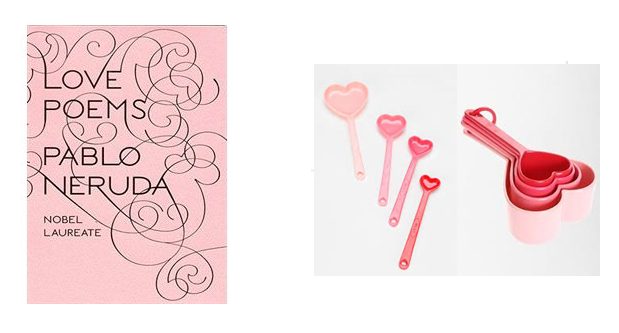 This next pick is a little less romantic but definitely cutesy and perfect as a sweet Valentine`s Day gift for the domestic diva in your life! Each set of four comes in different shades of my favorite color and won`t break the bank. Urban Outfitters actually has a great selection of little gifts ranging from funny to saucy to sweet that won`t break the bank so I know this is cheating but honorable V-day Park Pick mentions go to this and this too! 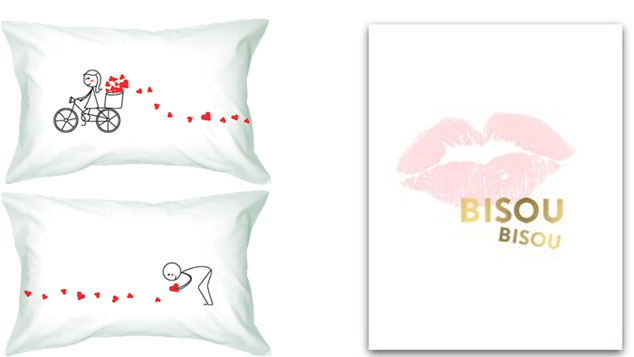 Cute and totally quirky, these pillowcases are available in multiple different designs and all put a smile on my face. I love this 'All My Love For You' design, as well as this one (so perf for my hubby and I) and this one (ha ha). Yes, I totally 'picked' an SS Print Shop print for one of my picks last week... but can you blame me for pulling a repeat? This baby has gold print, pink lips, and it says 'kiss' in french. How could I not? So Valentine's appropriate.